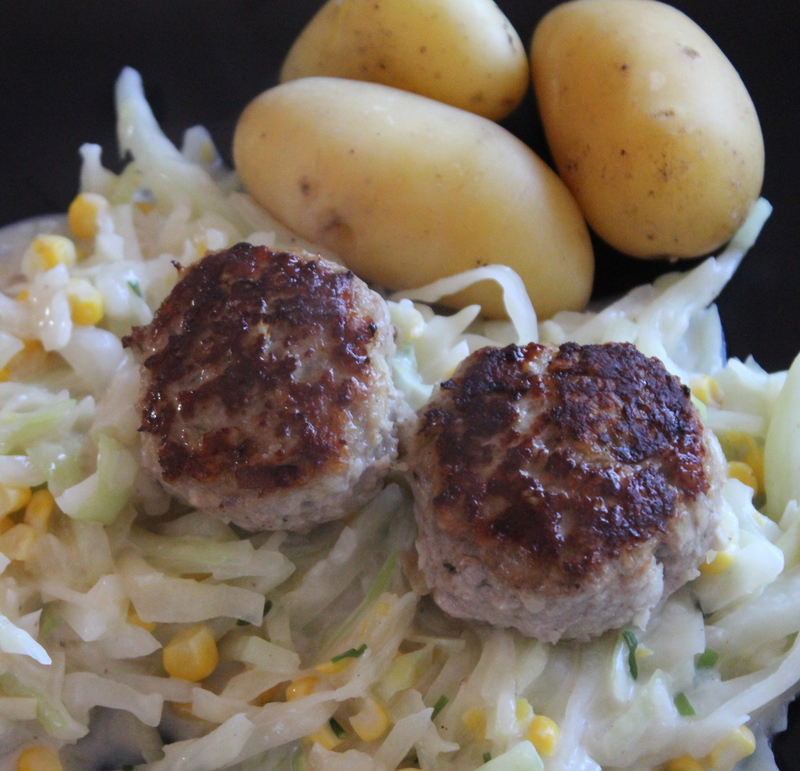 Meatballs and stewed cabbage is an old classic in the Danish kitchen, but many young people finds it boring, tasteless and totally overcooked! 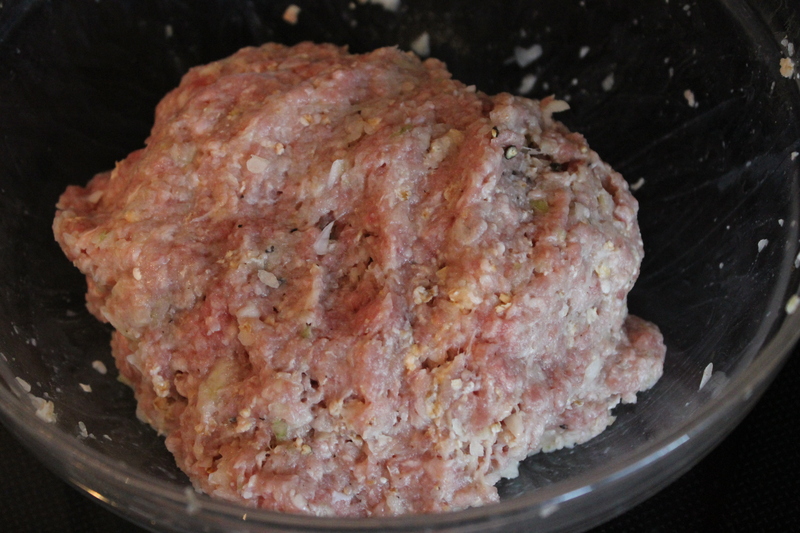 Combine all ingredients for the meatballs in a bowl and use your fingers to mix it together. Cover with plastic foil when combined and let rest in the fridge for at least 30 minutes, preferably 1-2 hours. Divide the meat into 16 equally sized pieces and form as small balls. Melt half of the butter at medium heat and place half of the meatballs in the pan. 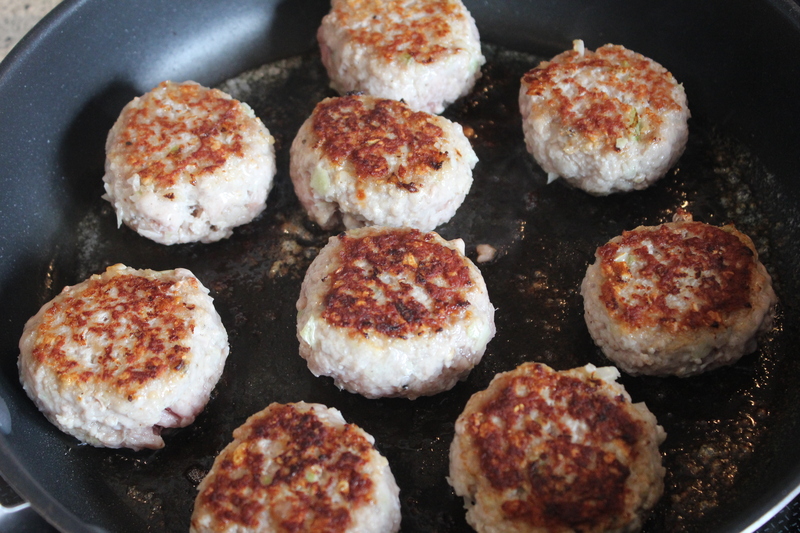 Press slightly on top of the meatballs so they get a bit flat instead of round. Fry for 6-7 minutes on each side. Place in a 200F warm oven while frying the other half of the meatballs. Keep warm until serving. Cook the sliced cabbage in salted water 12 minutes. Transfer to a colander and let the water drip of. 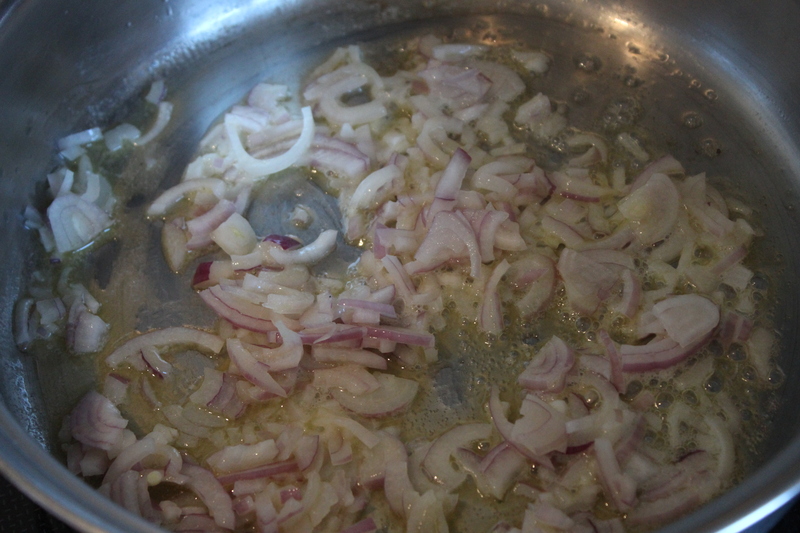 Melt butter and sauté sliced onions until soft. 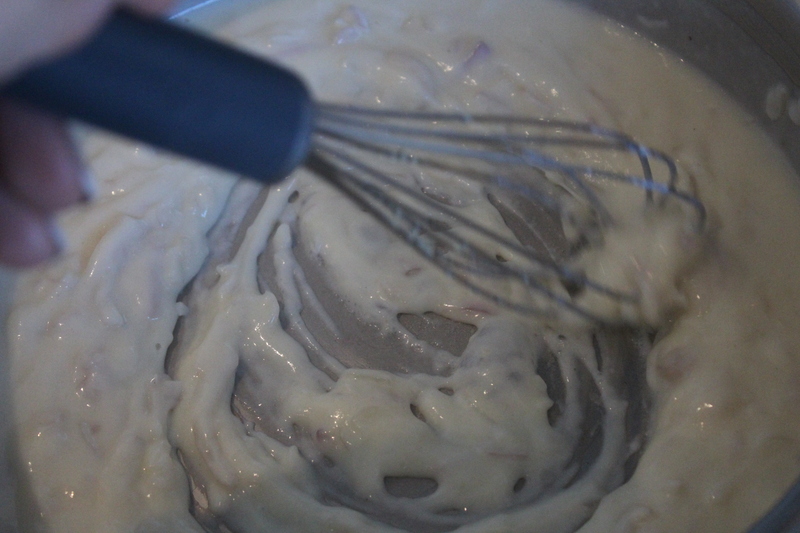 Add the flour and whisk well until the butter has absorbed the flour and the roux is thick and shiny. 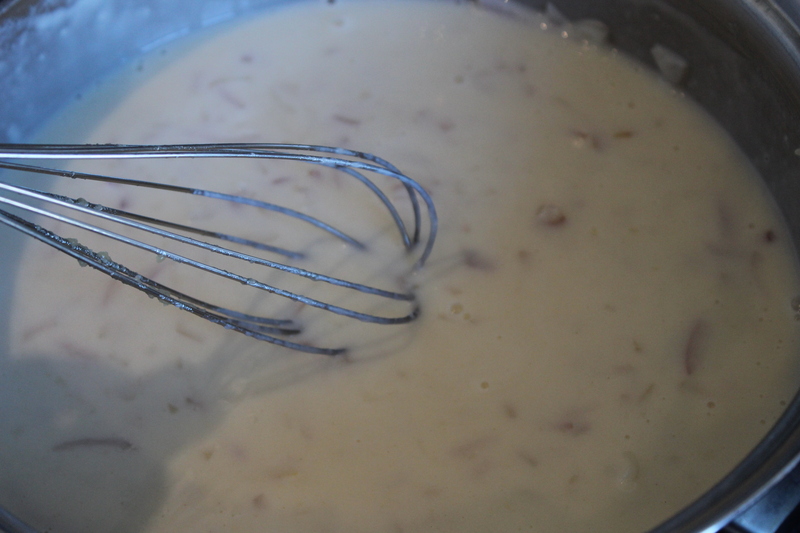 Slowly pour the milk into the roux while whisking. Be careful not to add to much milk at a time – the roux needs to keep cooking ALL the time and adding too much milk will slow down the process. Add the corn, season with salt and pepper and let cook at low heat for 5-10 minutes. 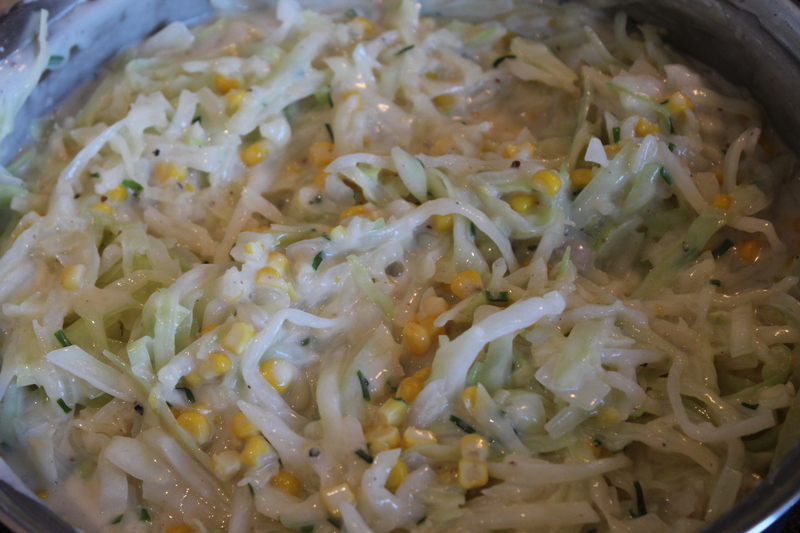 Add the cooked cabbage and chopped chives a few minutes before serving and make sure that all cabbage gets turned in the sauce. The number of tomato varieties are HUGE and comes in several different colors and shapes. My (Ann) parents has been growing tomatoes as long as I can remember and my dad always wants to try new varieties. This year he decided to to the yellow pear tomato and he sowed several seeds hoping to get a plant or two – but unexpectedly they all grew and he ended up with 7 or 8 plant of this specific sort (and then came the 3 others sorts he sowed the year). Melt butter in a saucepan, add chopped onions, garlic, thyme and ground pepper. Sauté for a few minutes until the onions begins to soften – then add the chopped tomatoes and jalapeños. Stir and let cook for about 5-8 minutes until the tomatoes gets soft. When the tomatoes has softened, you can the chicken stock and bring to a boil. When boiling add salt and turn down the heat. Let simmer for approximately 2 hours or until it looks like the picture below. Stir occasionally. Transfer the cooked tomatoes to blender and blend until smooth. Pour into sterilized jar, close immediately and fridge until use. Can be stored in the fridge for up to 4 weeks. 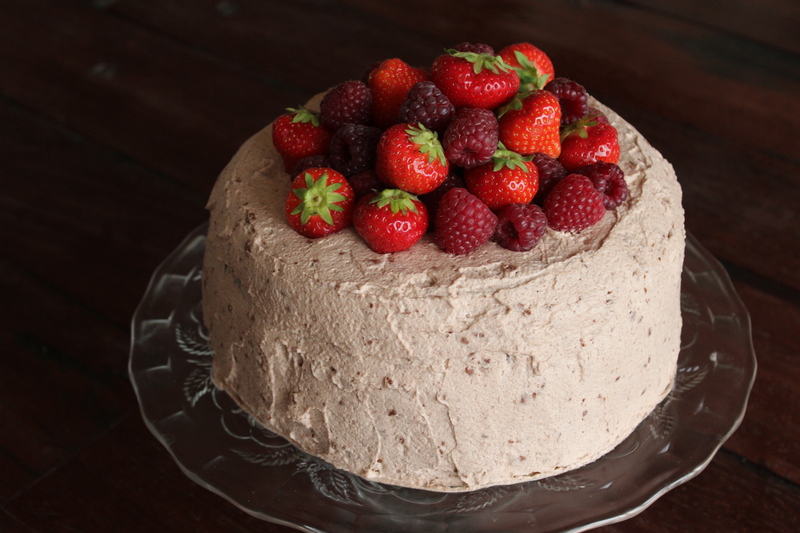 If you are more into chocolate than blackberries, you can of cause change that part of the recipe, but if you do that, I would recommend that you chop the chocolate and fold it into the batter instead of placing it in the middle, like the blackberries. Place bananas in a bowl ans mash well. Set aside while preparing the rest. Shift flour, baking powder, soda, salt cinnamon and nutmeg into a bowl. Add sugar and mix well. In a second bowl, with a folk, beat together eggs, vanilla extract, honey, butter and milk. Add the bananas to the egg mixture and stir to combine. Pour the flour mixture into the egg mixture in three steps, folding gently between each. 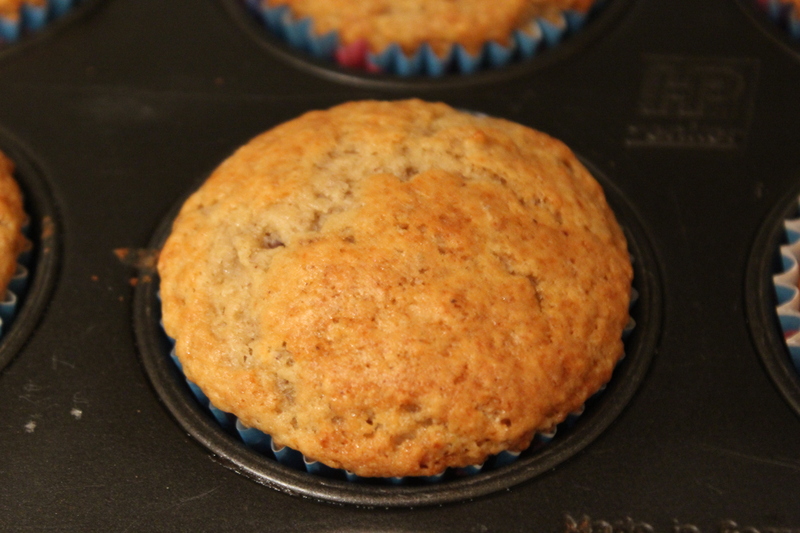 Line standard muffins tins with paper liners. Fill each paper line with 1 tsp. of the banana batter. 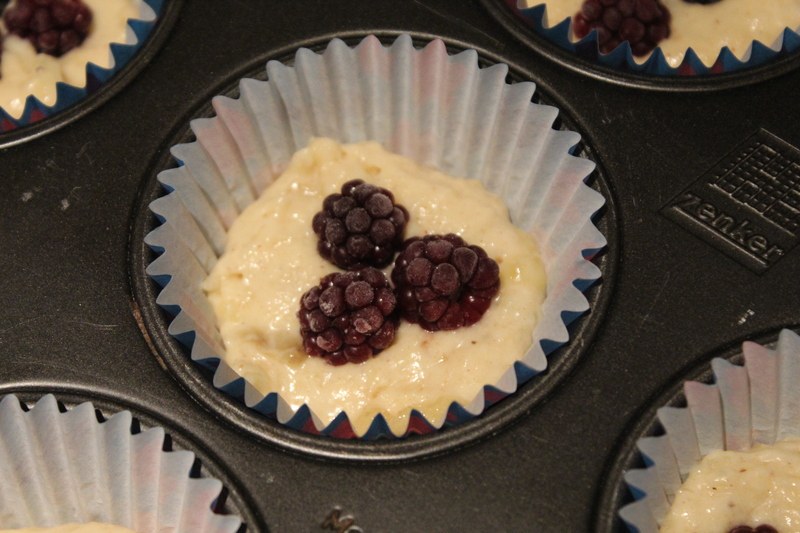 Then place 4 blackberries in the middle of the batter. Then add another tsp. of the batter. Make sure that the blackberries are fully covered with banana batter. Bake at 375F for 20 minutes or until at toothpick comes out clean. 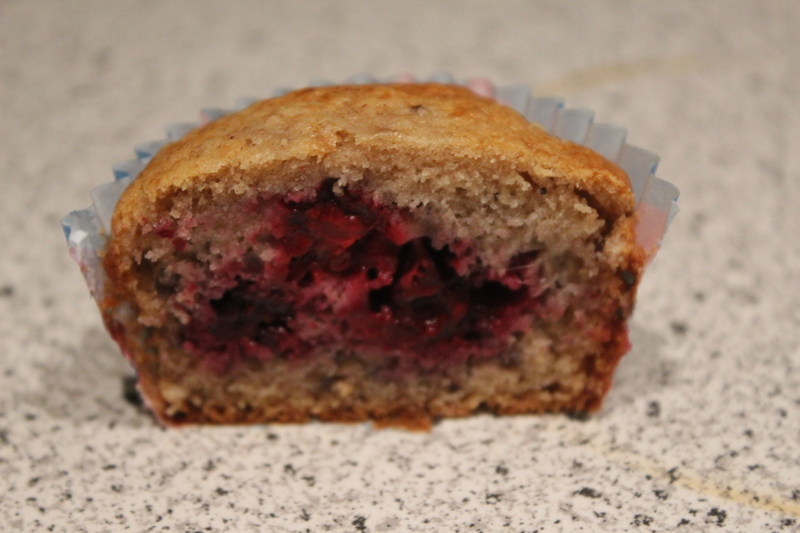 Let rest in muffin tins for 5 minutes and then 5 minutes in a wire rack. While cooling, melt the butter in a saucepan and let brown lightly (be careful not to burn). 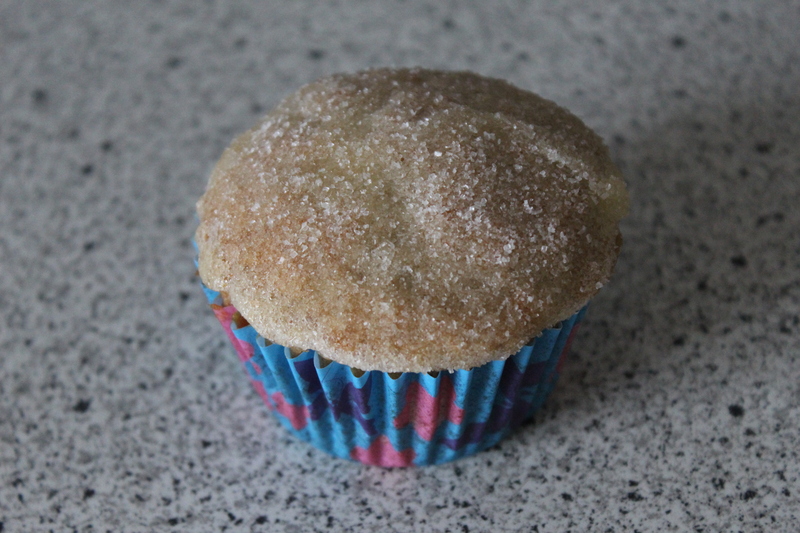 Transfer to a small bowl – same diameter as the muffins. 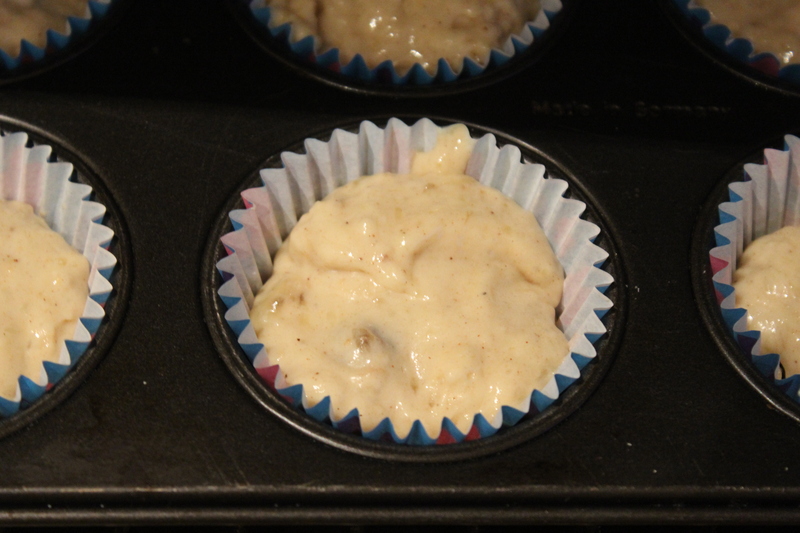 Dip the top of the cupcakes in the browned butter and sprinkle with sugar. Add yeast, water, beer and vinegar to mixing bowl and stir to combine. Add the remaining ingredients and use our fingers to combine. Knead until just combined and the dough is still wet and lumpy. Cover with plastic foil and leave on the kitchen table to raise for 12-18 hours (the longer, the better). Cover your kitchen table with flour and pour the wet and raised dough out. Fold it together one from each side (= 4 times) and place it in a greased dish and cover with plastic foil and let raise in a warm place for two hours. Put you casserole into a water bath one hour within the raising time if it is made of clay. Leave it covered in water for 10 minutes before placing it in a cold oven. Turn the oven on to convection at 430F or regular oven at 460F. Take the hot casserole out of the oven when the two hour raising time is finished. Sprinkle the bottom of the casserole with flour, pour in the dough and sprinkle with flour again. Put on the lid and place the casserole in the oven and bake for 30 minutes. Then remove the lid, and turn down the heat to 400F/430F and bake for additional 15 minutes. 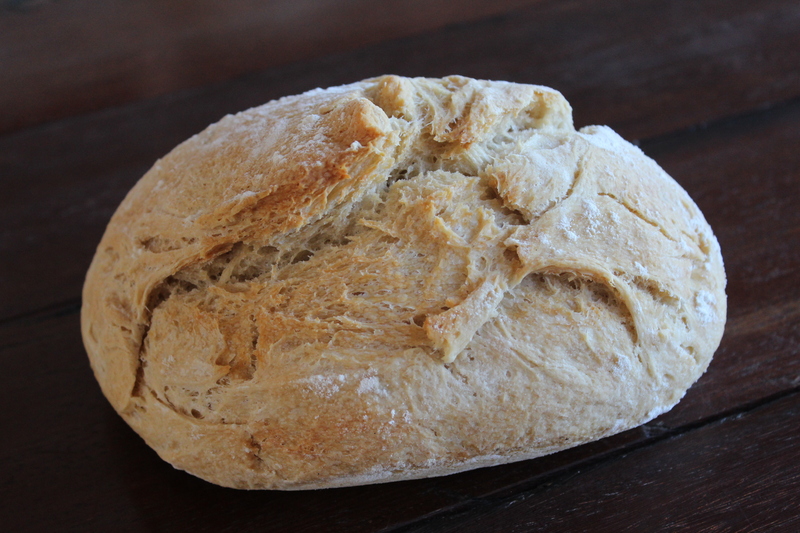 Remove the baked bread from the casserole and let rest on a wire rack for 15-20 minutes before serving. 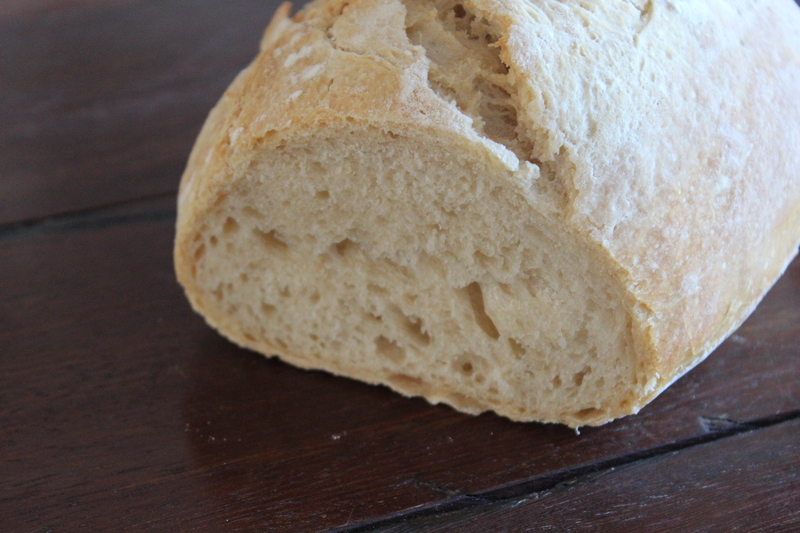 As you can see on the picture below, the bread is not as light as expected. This because I folded the dough twice from each side instead of only one as advised in the recipe. So be careful not to knead the dough or fold to to much, as it will remove the air bubbles and leave the finished bread more dense. Melt butter and sugar in a sauce pan. Stir to combine. When melted and combined, transfer to a mixing bowl and whisk at medium speed until cooled (takes 5-10 minutes). In another bowl mix together cocoa powder, flour, salt, baking powder and baking soda. When the butter and sugar mixture is cooled, add one egg at a time and whisk between each. Then add vanilla extract. Shift in flour mixture in four batches, alternating with the sour cream, and whisk until just combined. Add the melted chocolate and gently fold it into the batter with a rubber spatula. Add the batter to a springform pan and bake at 350F for 45 minutes or until a toothpick comes out clean in the middle of the cake. Let cool for 20 minutes before loosening the edges of the cake with a butter knife (but do not remove in from the springform). Let cool completely before removing the cake from the springform pan. Slice the cake into 3 equally thick pieces. I do not have a tool to do it with, so I just use a piece of wire, which works very well. Whisk the cream until it gets soft peaks. Then whisk a little bit more, but be careful not to over whisk and turn it into butter! It just needs to be thick enough to cover the cake without running off. 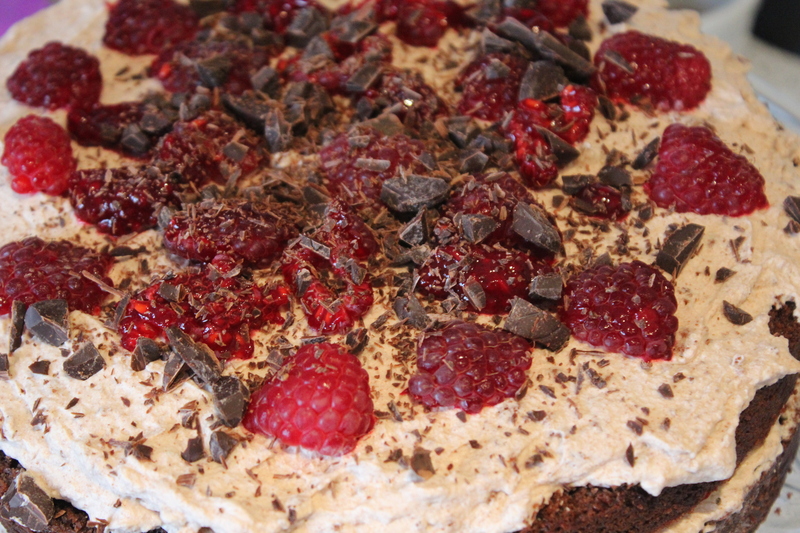 Add the crushed chocolate meringue cookies when the whipped cream has reached the wanted consistency. Fold until combined. Place the bottom of the three cake slices on a cake stand. 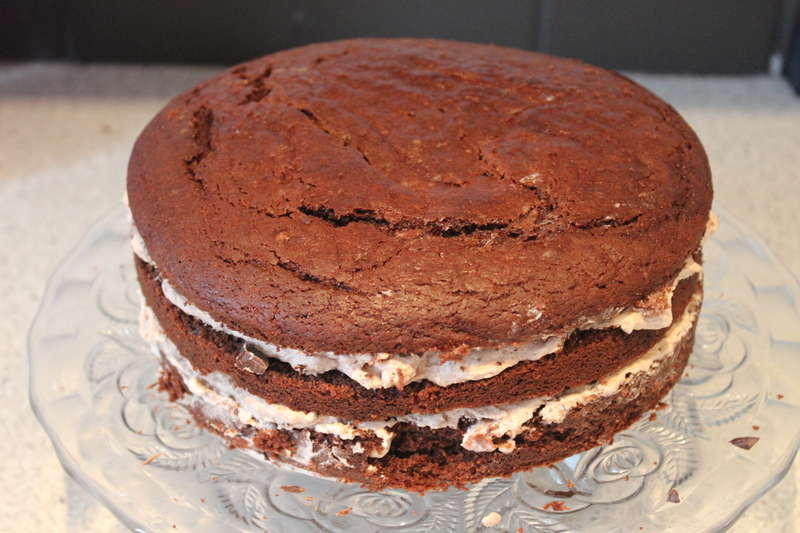 Spread 1/2 cup of whipped cream onto the cake in an equally thick layer all the way around. 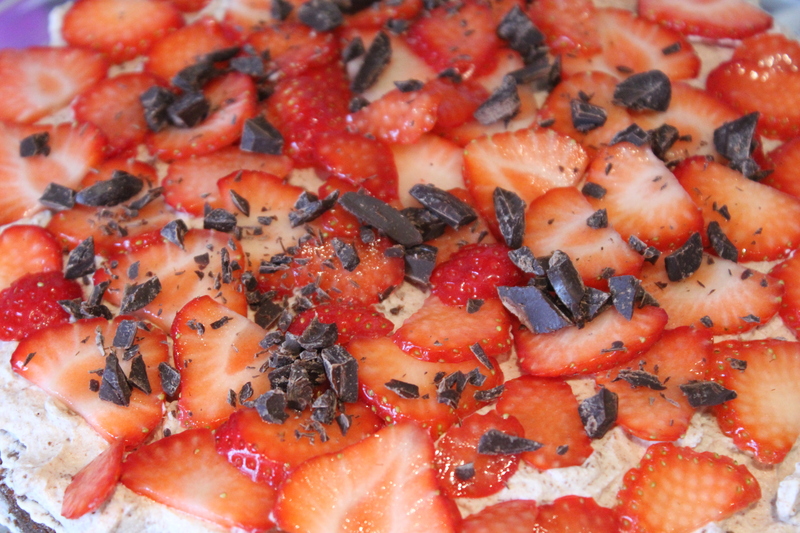 Slice 10 strawberries and place them on top of the whipped cream. Sprinkle with half of the chopped chocolate. Place the middle-slice of the cake on top and repeat the procedure, but replace the strawberries with half of the raspberries. Then top of the cake with the last slice. Place pork, onion, garlic, bread crumbs, egg, feta cheese, sun dried tomatoes and basil in a mixing bowl and stir to combine. Season with salt and pepper, cover with plastic foil and fridge for 30 minutes. 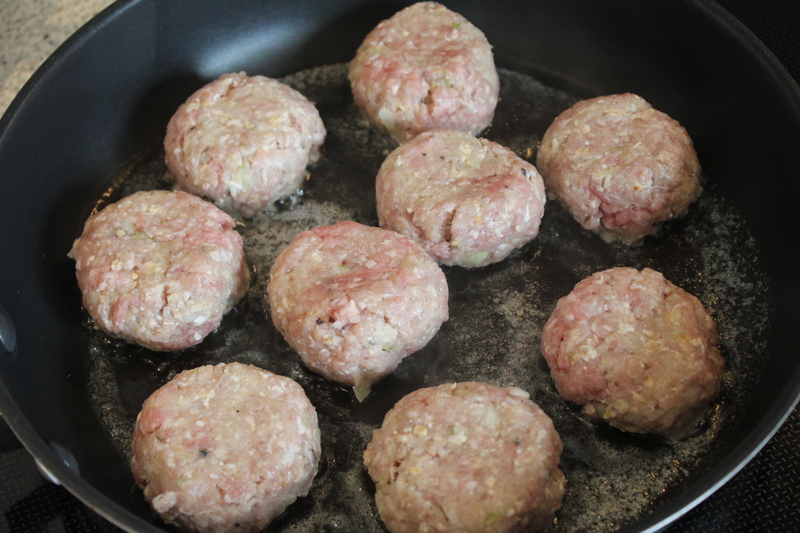 Form the meat into small balls – the size of a golf ball, and fry in melted butter on a medium/hot pan – one minute on each side. Transfer the meatballs to a heat proof dish, cover with one cup of tomato sauce and bake in the oven for 20 minutes at 350F. Approximately 10 minutes before the meatballs are finished, you can begin to heat the tomato sauce (if it is pre-made) and cook the gnocchi. Place the remaining 2 cups tomato sauce in a saucepan and warm at medium/low heat for 5 minutes. 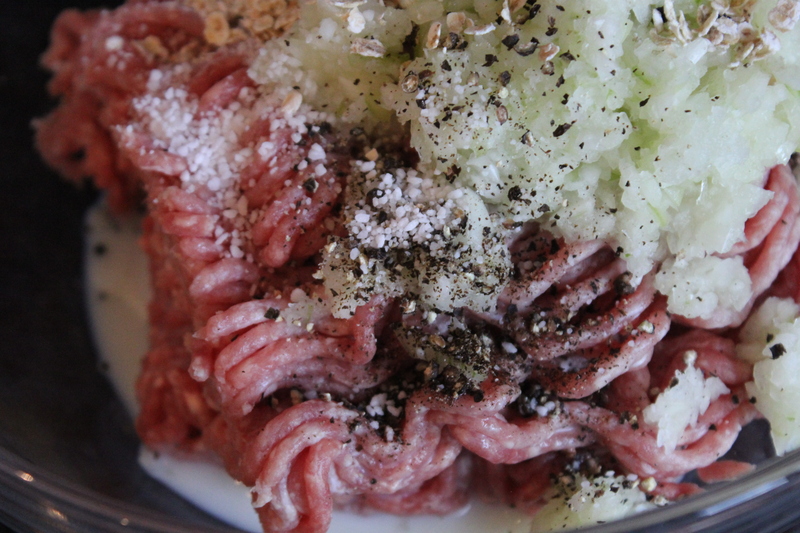 Add the gorgonzola, let it melt, stir to combine and keep warm until serving (low heat). Season with salt. Cook the gnocchi as described on the back of the package (most descriptions says 3 minutes in salted water). Transfer to colander and let all water drip off. Place the cooked and drained gnocchi into the heated tomato sauce. 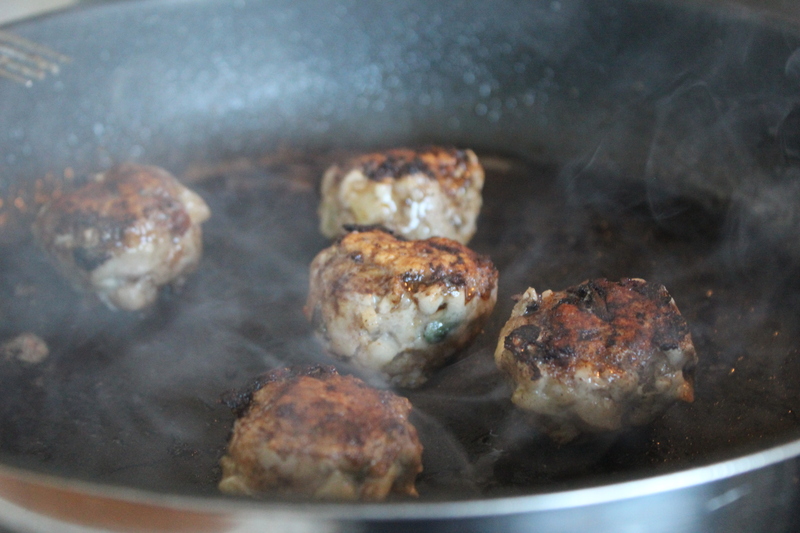 Take the meatballs out of the oven and stir a few times to combine the sauce around the meatballs. Place gnocchi with tomato sauce in a soup plate. 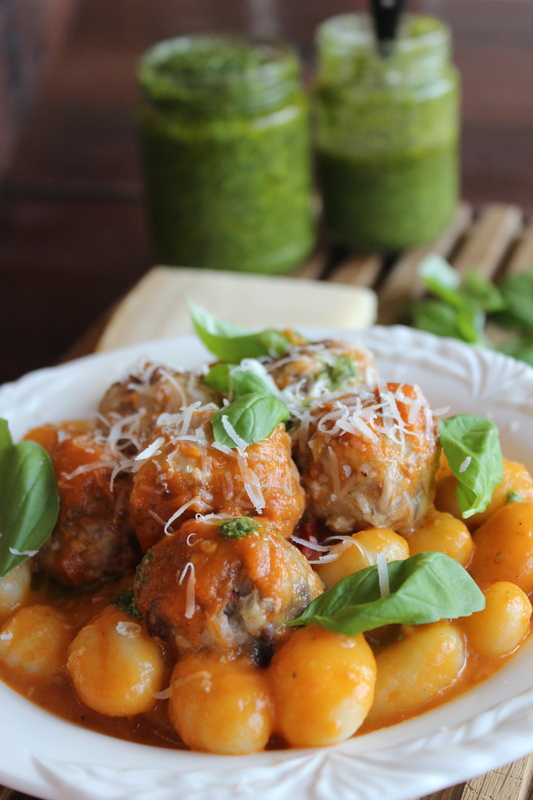 Place 3-4 meatballs on top of the gnocchi and decorate with basil leaves, grated parmesan cheese and pesto. Most people buy a pre-fabricated tomato sauce in the super market, because it is easy, comfortable and cheap. But have any you considered how many additives it contains, as it can be stores at room temperature for several years?? It sounds a bit holy, but we are not – we often buy ingredients with 2-3 years expiration. Hope that you will love it too! Chop onions, garlic cloves and tomatoes. Melt butter in a medium sized saucepan and sauté the chopped onions and garlic cloves for a few minutes. 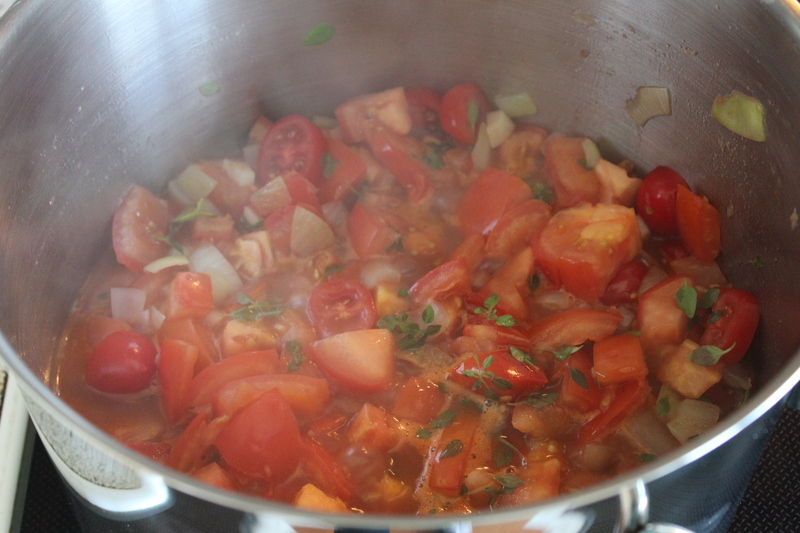 Add the chopped tomatoes, stir and let cook at medium heat until the tomatoes has softened – it takes 5- 10 minutes. Stir occasionally. Add the remaining ingredients and cook for 5-10 minutes or until the alcohol in the red wine has evaporated (when the smell of red wine has disappeared). Reduce heat and cook for an additional hour. Remove the cooked sauce from the heat and let cool for 15-20 minutes. Transfer to blender and blend until completely smooth. 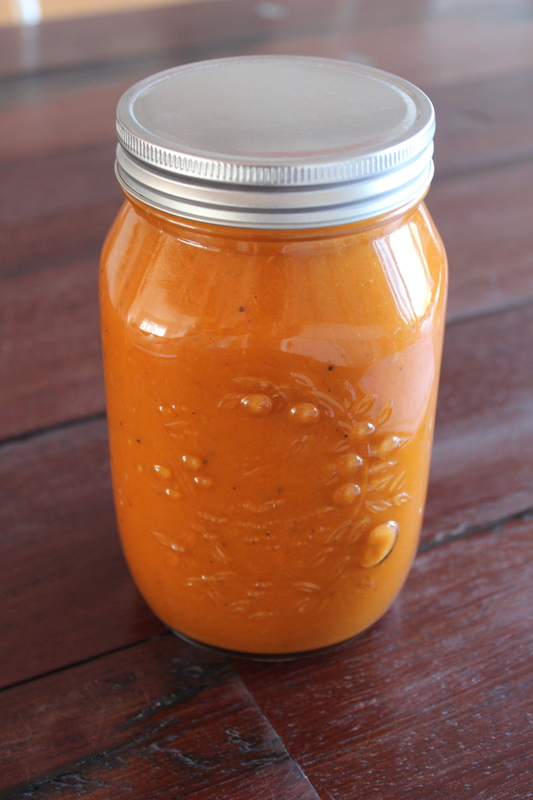 Store in a sterilized jar in the fridge for up to 4 weeks.